Wildlion purred and licked at the single tom-kit at her side as he mewled and squealed for milk. As she touched her nose to the kit, she sent a silent thanks to StarClan for a healthy kit. "Let all cats old enough to catch their own prey gather for a clan meeting!" yowled Wingpelt from the top of Splashstar's den. Nightleg pricked up his ears and padded over to hear what Wingpelt had to say. "I, Wingpelt, medicine cat of RiverClan, call upon my warrior ancestors to look down upon this apprentice. He has trained hard to understand the way of a medicine cat, and with your help, he will serve his Clan for many moons. Seedpaw, do you promise to uphold the ways of a medicine cat, to stand apart from rivalry between Clan and Clan, and to protect all cats equally, even at the cost of your life?" "Then by StarClan, I give you your full medicine cat name. Seedpaw, you will be known as Seedstorm. 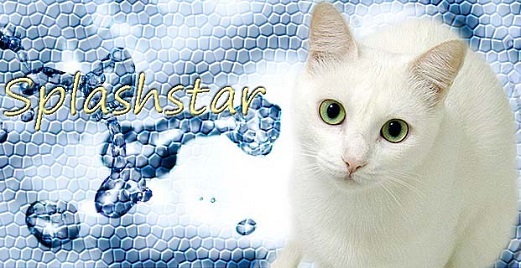 StarClan honors you and we welcome you as a full medicine cat of RiverClan." Leaping down from the den, Wingpelt padded forward and rested his muzzle on top of Seedstorm's head. Seedstorm licked Wingpelt's shoulder, then sat back and listened to the clan call out his new name. "Seedstorm, Seedstorm, Seedstorm!" cheered Sunfur for the clan's newest medicine cat. Wingpelt padded into the RiverClan camp, carrying marigold in his jaws. He made his way into the den he shared with Seedstorm, placing the marigold into the storage. "Let all cats old enough to catch their own prey gather for a clan meeting!" yowled Splashstar from the top of her den. Silverlight pricked up her ears and padded out of the elder's den to hear what Splashstar had to say. "We gather today to welcome two kits into their lives as apprentices." continued Splashstar once the clan had gathered. "Bluekit, you will be known as Bluepaw. Pearlmist, you will be mentor to Bluepaw. Yellowkit, you will be known as Yellowpaw. Leopardrose, you will be mentor to Yellowpaw." Bluepaw puffed out her chest and padded over to Pearlmist. Yellowpaw purred happily to herself and padded over to Leopardrose. "Let's go check out the territory." meowed Pearlmist as she touched noses with Bluepaw. "Go get to know your new denmates." meowed Leopardrose as he touched noses with Yellowpaw. "Bluepaw, Yellowpaw! Bluepaw, Yellowpaw!" cheered Foxcloud for the clan's newest apprentices. Wingpelt padded into the RiverClan camp, carrying juniper berries in his jaws. He made his way into the den he shared with Seedstorm, placing the berries into the storage. Amberstripe pricked up his ears and padded over to hear what Splashstar had to say. "Wingpelt, is it your wish to give up the name of medicine cat and go to join the elders?" called out Splashstar once the clan had gathered. "I call upon StarClan to give you many seasons of rest, your clan thanks you for your service." finished Splashstar. "Wingpelt, Wingpelt, Wingpelt!" cheered Amberstripe for the clan's former medicine cat. Seedstorm padded into the RiverClan camp, carrying dock in his jaws. He made his way into his den, placing the dock into the storage.